The focus is the expansion of the church and how it was addressed by the apostles with the Holy Spirit working behind the scenes. This was not a smooth process. In fact, it led to hostile reactions, the death of Steven and persecution from the Jewish leadership. Ultimately, it forced upon the new church a scattering which led them to do what Jesus had commanded, to be witnesses in Judea and beyond. Does the process of legitimate growth sometimes bring growing pains and difficult change? In order to confront the problem of the inequity of distribution of aid to widows the apostles were challenged to become leaders whose skills were based on Biblical principles. What are essential leadership skills? The solution to this problem is the beginning of the idea of split roles in the church, the teaching ministry (spiritual) and the ministering to needs of the congregation (physical). In both, the key idea is service based on humility. A committee of seven was selected to minister to these physical needs. What do you think were the qualifications for those seven to minister to the physical needs of the new church? Resolution to the problem of distribution of aid to the widows introduces us to the seven men (more specifically Stephen), chosen by the new church on the basis of their qualifications of a Spirit-filled life resulting in wisdom. These qualities were manifested in their spiritual vitality, consistent walk and reputation among the body. Taking care of the less fortunate within a community is an individual responsibility, a volitional choice from the application of God’s Word which God doesn’t subvert by taking over the reins of our life. Leadership serves people not personal gain. Spiritual maturity discerns the difference. The result of the selection of these men was a division of authority which allowed pastors and administrators to focus on their number one priority. Passages in Stephen’s message are sometimes used by unbelievers as evidence of the Bible being full of contradictions. Inspiration and inerrancy of scripture is the cornerstone of belief in the Christian faith. Christians believe that the Bible is “God-breathed,” that the Holy Spirit supernaturally directed human writers in order that they “exhale” His Word exactly as God intended. This applies only to the original manuscripts. We no longer have these original documents, but Pastor Dean demonstrates how the discovery of what we do have can be discerned, compared and validated so that what might appear on the surface to be a discrepancy may be fit consistently with the inerrancy of the text without compromising the integrity of God's Word. 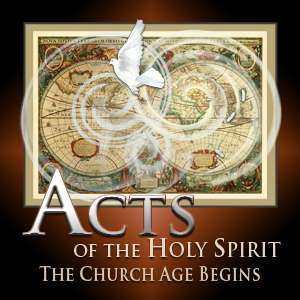 In Acts 1–7 we see the birth of the church, its growing pains and persecution by the Jewish leaders. By chapter 8, this persecution forces believers to leave Jerusalem and trust God to expand the church. The gospel spreads through Philip’s ministry. Saul is converted, but not trusted at first because of his history of persecution of the church. God leads Peter to the Gentile Cornelius who believed and received the Holy Spirit. Herod Agrippa instigates another reign of persecution but he soon dies and the Word of God “grew and multiplied.” It is God’s work to grow the church, not man’s accomplishment. Click here for the "Cruel Logic" YouTube video shown at the beginning of this class.